One of the things we love about Colorado is how uniquely different each venue’s scenery can be. At the beautiful Arrowhead Golf Club in Littleton, we found ourselves among stunning rock formations, reminiscent of Garden of the Gods. From start to finish, this August wedding was breathtaking as well as heartwarming. 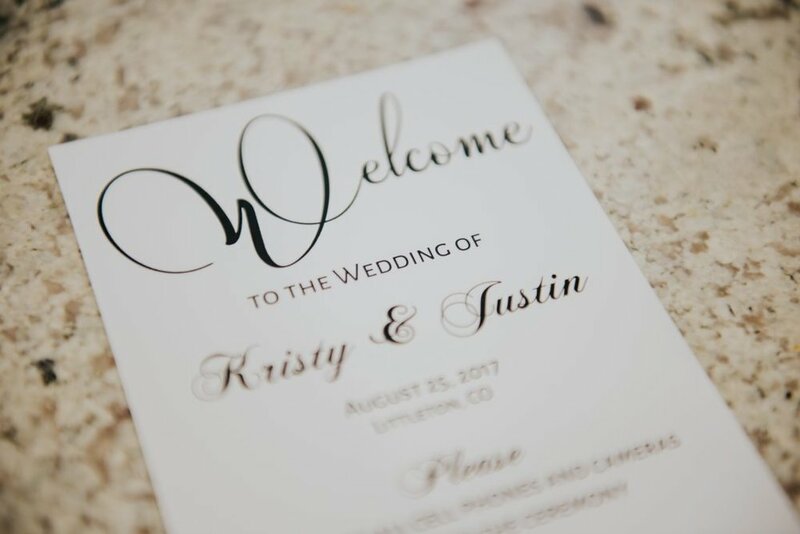 Kristy and Justin were both so ready to walk down the aisle and start their lives together, and they were surrounded by loving friends and family. The afternoon started with an outdoor lawn ceremony between the golf club and the golf course below, and the weather couldn’t have been better. The days leading up to the wedding had been cold and windy, but the skies cleared and the sun came out just in time for these two to tie the knot. White rose petals lined the aisle, with arrangements hanging intermittently on chairs. The ceremony table was home to a beautiful engraved wine box for the unity ceremony, and two matching vow books. As the ceremony began, guests and wedding party alike were trying hard to keep from getting emotional. 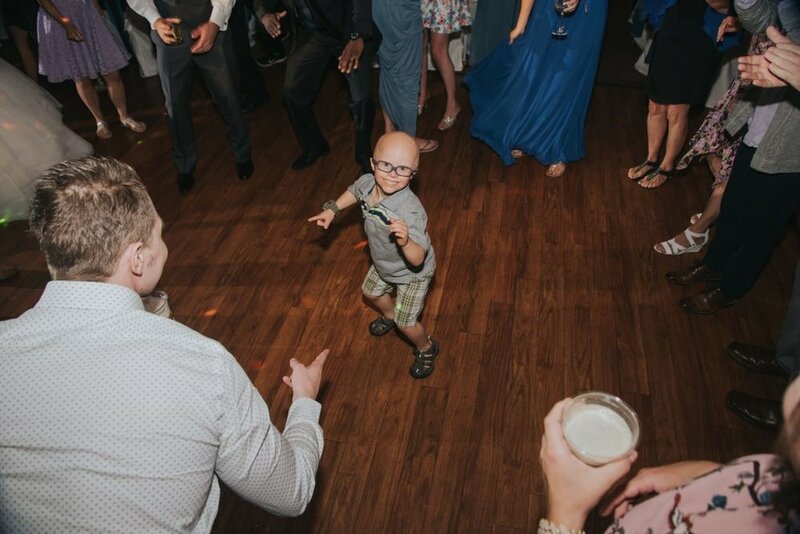 The bride’s 2nd cousin, Bryce, was the cutest ring bearer we had ever seen, and was seriously overjoyed to be a part of the ceremony! As the bride came down the lawn in her Martina Liana dress from the Bridal Collection, the tears started flowing. 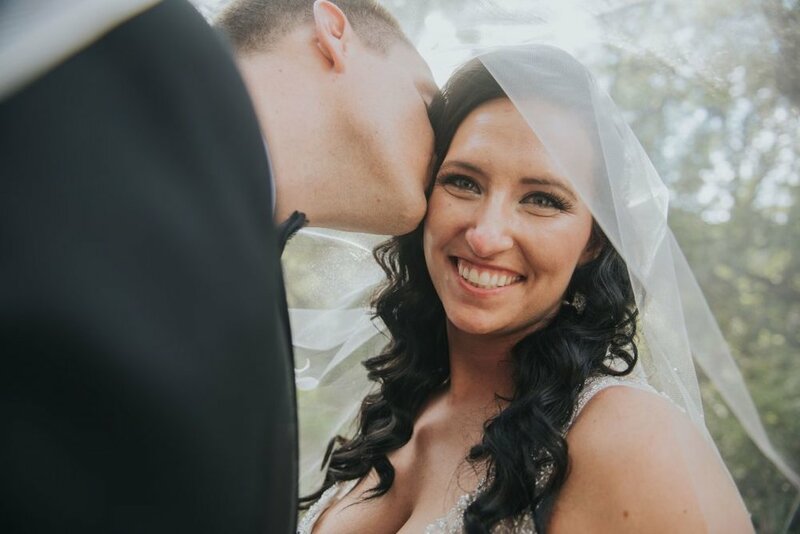 The couple said their I Do’s with Reverend Carrie MaKenna, then were swept away to take photos along the golf course while guests enjoyed cocktails on the terrace of the golf club. The reception area was beautiful with steel blue and white decor. The floral centerpieces (some high and some low) designed by Abloom were stunners. Kristy also did a wonderful job of matching the rest of her decor, guestbook, and signage. The look was formal, but not overstated. One of our favorite touches was the party favor on each place setting: a silver or brass key that doubled as a bottle opener. As the night went on, the couple chose to forego a few wedding traditions, like tosses, in order to make room for oh so much dancing! 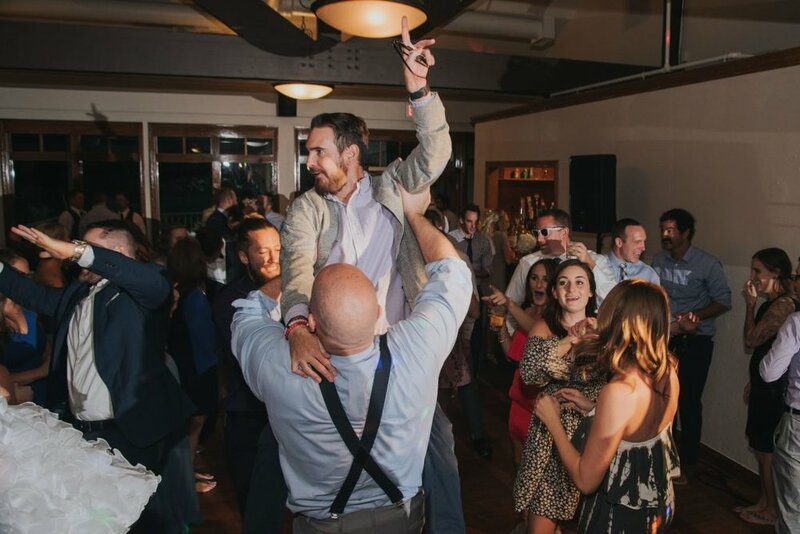 Colorado Wedding Productions provided hit after hit, and guests were on the dance floor for hours, working off the Azucar cake that they had a few too many bites of. People were having such a good time that it took longer than usual to finally usher them out to their cars as the night came to an end. It isn’t often that we are able to say a wedding went off without a hitch, but this one came pretty close. The bride and groom knew that it was their marriage that was most important, and were the perfect combination of laid back and organized. 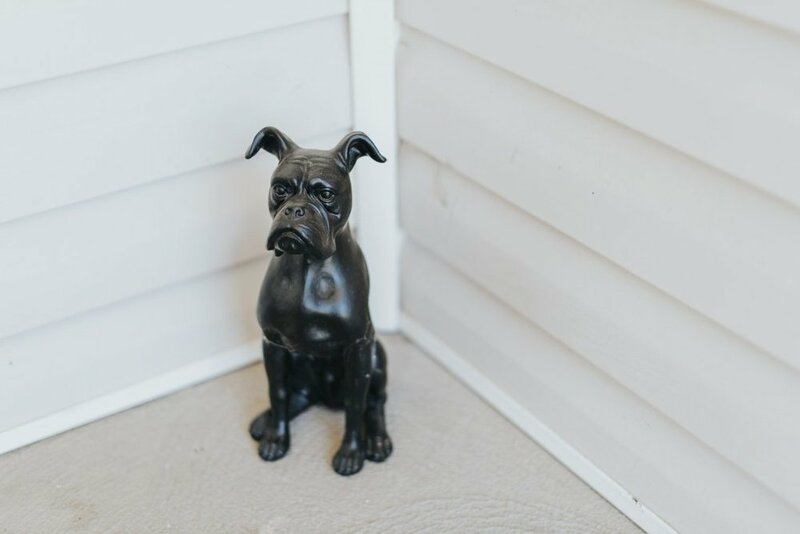 They put their guests first without sacrificing what they wanted. We were in love with the centerpieces, cake, and the rest of this fun filled evening, with colorful Colorado acting as the perfect backdrop. Special thanks to Allie at Elevate Photography for the amazing images!